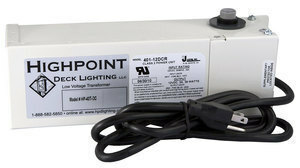 40 Watt DC LED Transformer. One 12V DC circuit with built in Photo cell. Powder coated white case. 60 Watt DC LED Transformer. One 12V DC circuit with built in Photo cell. Powder coated white case.